Hemorrhagic infarctions (otherwise known as intracerebral hemorrhage or cerebral bleed) are the result of spontaneous hemorrhage within the brain. Underlying conditions that predispose to hemorrhagic infarctions include hypertension, aneurysms and brain tumors. 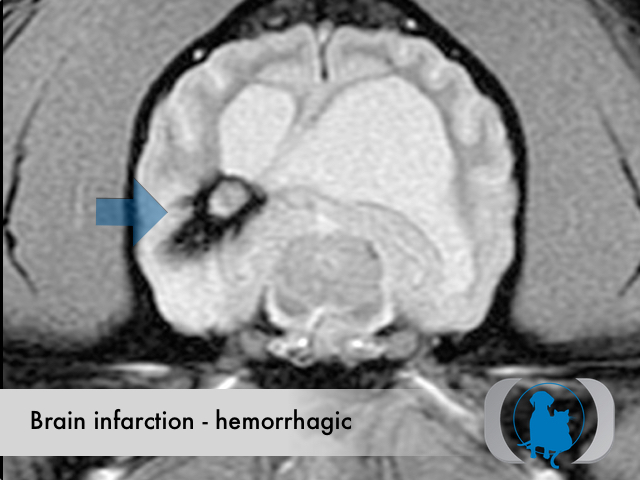 Hemorrhagic infarctions differ from nonhemorrhagic infarctions (otherwise called ischemic infarctions), that are associated with the acute interruption of blood flow to an area within the brain. The acute accumulation of blood within the brain leads to what is effectively a hematoma that causes an acute onset of symptoms secondary to the direct compression of the surrounding brain tissue. Compression of the brain tissue surrounding the hemorrhage leads to the subsequent disruption of the blood brain barrier. As a result vasogenic edema ensues secondary to an influx of water and proteins into the intracellular space. This typically occurs within 4-6 hours of the event and can continue for 3-5 days thereafter. 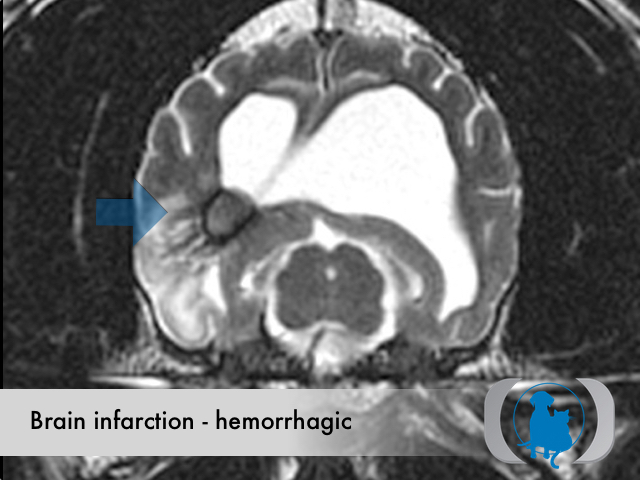 Clinical signs associated with hemorrhagic infarctions can include mentation changes, circling, and seizures for cerebral infarctions; hemi- or tetra paresis and cranial nerve deficits for brain stem infarctions; as well as vestibular signs for cerebellar infarctions. While the exact nature of the symptoms that occur vary with the location of the infarction, a key to the diagnosis is the acute nature of the onset of symptoms combined with the relative lack of progression shortly following their onset. 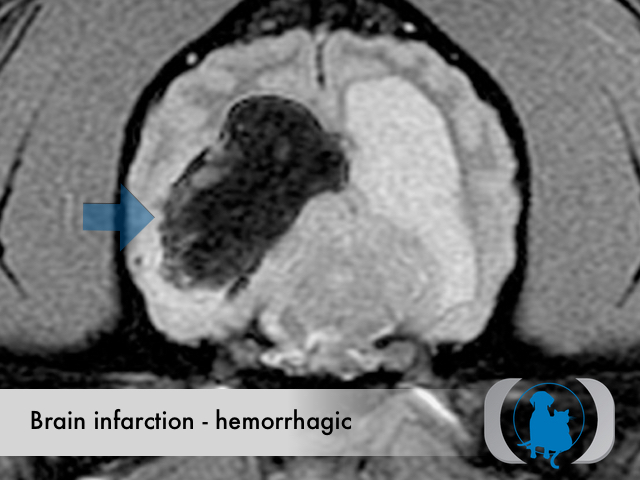 MRI is the diagnostic imaging modality of choice for diagnosing nonhemorrhagic infarctions. Hemorrhagic infarctions may demonstrate a variable signal intensity on MRI sequences based on the aging of the hemoglobin initially contained within the red blood cells. GRE T2* images are very sensitive to hemorrhage with blood appearing markedly hypointense. Therapy for hemorrhagic infarctions includes largely symptomatic therapy for seizures and the potential concurrent ataxia and paresis that may occur pending the location of the infarction. When possible, therapy directed at the cause of the infarction (e.g., hypertension) should be pursued. 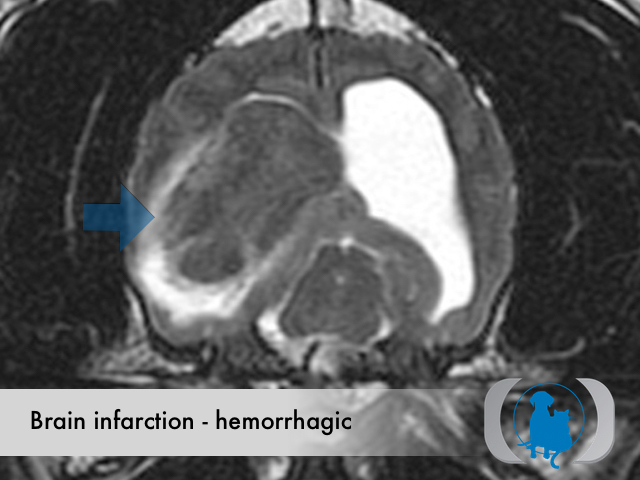 Unfortunately in most cases of hemorrhagic infarction in dogs and cats, the underlying cause for the infarction is not identified. Axial plane GRE T2* weighted MRI of the brain of a 6 year old Bulldog with acute onset of right cerebral symptoms. Note the large right sided, markedly GRE T2* hypointense mass consistent with hemorrhagic infarction (blue arrow). Axial plane T2 weighted MRI of the brain of a 6 year old Bulldog with acute onset of right cerebral symptoms. Note the large right sided, T2 isointense mass consistent with hemorrhagic infarction (blue arrow). Also note the loss of normal CSF signal within the sulci overlying both cerebral convexities indicative of increased intracranial pressure. Axial plane FLAIR MR image of the brain of a 6 year old Bulldog with acute onset of right cerebral symptoms. 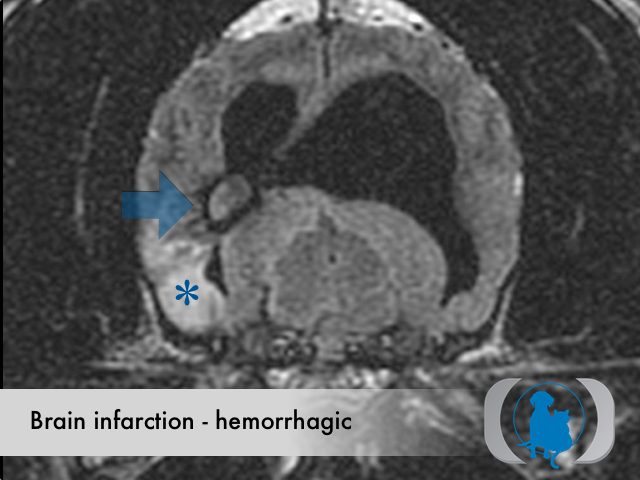 Note the large right sided, FLAIR hypointense mass consistent with hemorrhagic infarction (blue arrow). Also note the FLAIR hyperintense vasogenic edema peripheral to the large hematoma (blue asterisk). Axial plane GRE T2* weighted MRI of the brain of a 6 year old Bulldog 1 month following acute onset of right cerebral symptoms. Note the much smaller right sided, GRE T2* mixed signal mass consistent with resolving hemorrhagic infarction (blue arrow). Axial plane T2 weighted MRI of the brain of a 6 year old Bulldog 1 month following acute onset of right cerebral symptoms. Note the much smaller right sided, T2 isointense mass consistent with resolving hemorrhagic infarction (blue arrow). Axial plane FLAIR MR image of the brain of a 6 year old Bulldog 1 month following acute onset of right cerebral symptoms. 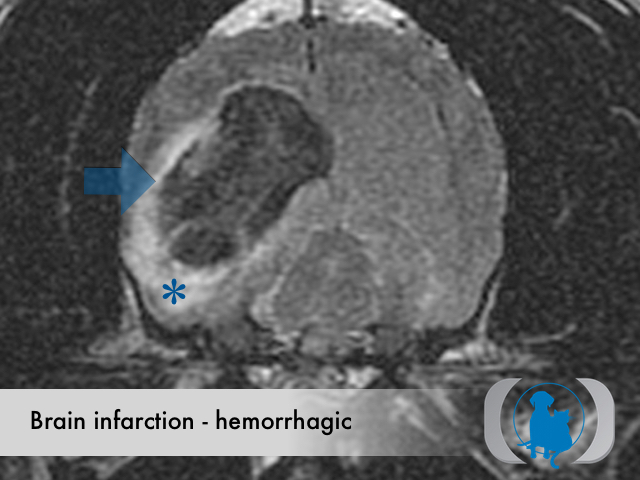 Note the much smaller right sided, FLAIR isointense mass consistent with resolving hemorrhagic infarction (blue arrow). Also note the FLAIR hyperintense vasogenic edema peripheral to the large hematoma (blue asterisk).